﻿Published by Sareth Ney on Dec. 13, 2016 at 4:36 p.m. Updated on Jan. 13, 2017 at 2:39 p.m.
SOMERSET, Wis. – Northern Invasion will take place at the Somerset Amphitheater, from May 13 through May 14. It will be headlined by Soundgarden and Kid Rock. 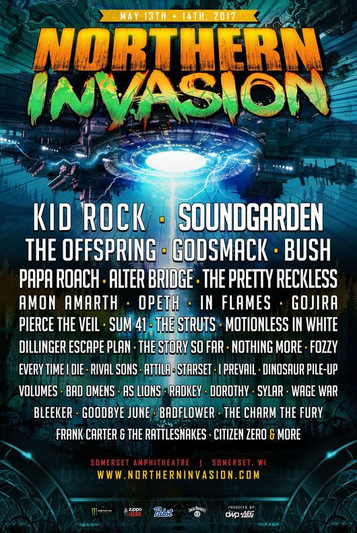 Along with Soundgarden and Kid Rock, the following artists are set to perform at Northern Invasion: Alter Bridge, Amon Amarth, As Lions, Attila, Badflower, Bad Omens, Bleeker, Bush, Citizen Zero, Dinosaur Pile-Up, Dorothy, Every Time I Die, Fozzy, Frank Carter & The Rattlesnakes, Godsmack, Gojira, Goodbye June, I Prevail, In Flames, Motionless In White, Opeth, Nothing More, Papa Roach, Pierce The Veil, Radkey, Rival Sons, Starset, Sum 41, Sylar, The Charm The Fury, The Dillinger Escape Plan, The Offspring, The Pretty Reckless, The Story So Far, The Struts, Volumes, Wage War and more will be announced. "Looking forward to bringing the Smack to Northern Invasion,” says Sully Erna (vocalist and guitarist of Godsmack). “It’ll be awesome to share the stage with so many great artists." Presale tickets are now available and can be purchased at www.northerninvasion.com. Options include layaway packages, hotel, camping and very important person (VIP) are available. Tiers for camping include Groupie, Roadie, Star and Ultimate Package at Float Rite Park can be purchased. Hotel packages for bronze, silver, gold and platinum are also an option. Camping and hotel packages come with a $25 festival merchandise voucher for each person. Password for presale tickets can be found by visiting Northern Invasion’s Facebook and Twitter pages. Prices for the presale weekend general admission tickets are $89.50, weekend VIP is $189.50, weekend general admission ticket four-pack is $259.00. Active duty military personnel will receive a general admission discount through GovX and the prices exclude fees. On Dec. 16 at 10:00 Central Time, the Northern Invasion public on-sale will take place and price of admission will increase. The price changes are: $99.50 for weekend general admission, $199.50 for weekend VIP ad $359.00 for weekend general admission ticket four pack. Active duty military personnel will receive a general admission discount via GovX and ticket prices do not include fees. Sponsors of Northern Invasion consist of: Jack Daniel’s, Monster Energy, Pabst Blue Ribbon Brewing Company, Zippo and more.